I recently moved from full-length resizing to neck sizing using the Lee collet necksizer and deadlength bullet seater. Basically it makes a lot of sense, but it caused me to think about an unused die in my full-length 30-06 set, which is a "factory crimper" that uses a collet much like the neck sizer does. It sounds like it might be useful to give each newly-loaded round a quick squeeze with that particular die as a final operation. What opinions do people have about that? Useful? Can't hurt? Waste of time? On another note, the Missouri Department of Conservation recently reopened the unsupervised firing range at a conservation area north of Columbia. It had suffered over the years from abuse and littering, but the newly remodeled range looks great, and this past weekend there was a volunteer from MDC out keeping an eye on things and occasionally sweeping up the .22 rimfire debris. I decide to cruise the open lanes and do a little picking up of my own and came home with my pockets bulging with close to 200 empty 9mm brass, mostly Remington (103) and Winchester (45) as well as a smattering of .223 and other calibers. I noticed this waste when the range was open before, but I still find it hard to tolerate not only the waste, but the inconsiderateness of the users. Personally, I would like to see the volunteer program expanded and pay a nominal fee to shoot. Certainly if used consistantly it can give you a uniform neck tension that is greater than what the other seater applies. In theory this will give a uniform release pressure and improve uniformity of loads. BUT... I think Speer said not to use it with some of its bullets as it impaired the jacket. Indeed if you pull some tightly crimped bullets like I had loaded for an M1 you will see a ring in the jacket. 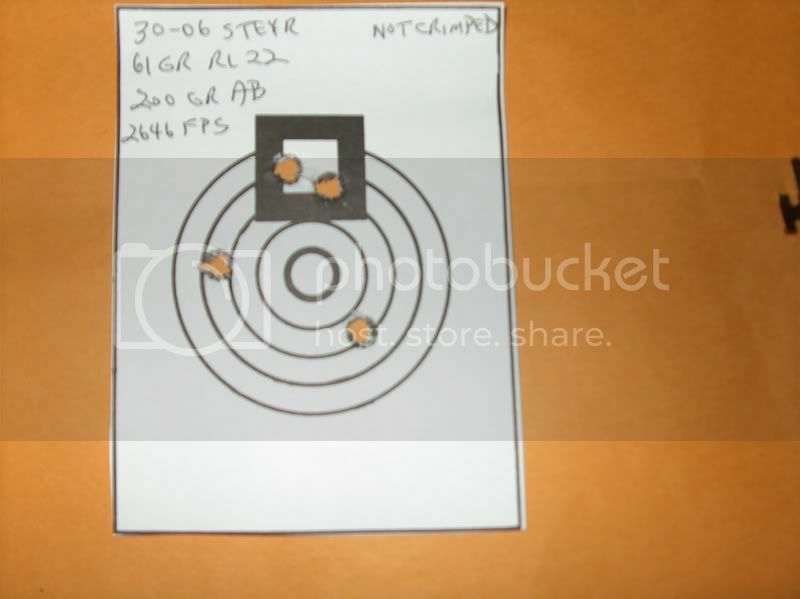 Try a set of 5 -10 bullets with the crimp and 5 without. If the SD's and accuracy are statistically significantly different... you will have your answer. I know there are a lot of differences of opinion on this, but I have always resisted crimping unless absolutely necessary (revolver cartridges and some tubular fed rifles). I have never seen that accuracy improves with crimping other rounds and usually it decreases. Properly sized necks will hold the bullets under most circumstances quite well. Case length becomes even more critical with crimped cartridges than those that are not. The reasoning lies with the fact that as cases grow, crimping can cause unintentional pressure swings as the case lengthens. Longer cases mean that the crimp setting of the die provides a heavier crimp with these longer cases than with those of “standard” length. If you are going to crimp, you should consider trimming brass for each loading session. Though case-neck turning is often thought to be a waste of time for anything other than match-grade ammunition it makes a lot of sense if a person insists on crimping. Case necks that vary in thickness around their circumference will also fail to provide an even crimp on the bullet as a result of these varying thicknesses. Accuracy with cases such as these can be less than hoped for. This applies to revolver cartridges as well as bottleneck cases. 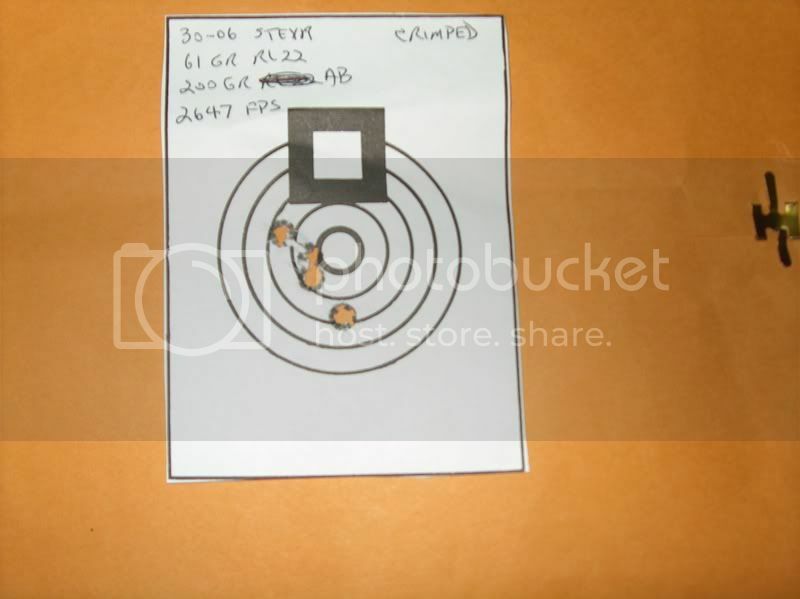 A uniform pull to the bullet is necessary for consistency and accuracy. The final drawback is maybe more cosmetic than functional, but I have always marveled at the diligence loaders go through to find bullets without blemishes only to mar them by crimping the case mouths firmly into their sides! Maybe this doesn’t really cause accuracy problems, but I personally don’t even like cannelured bullets when working up an accuracy load. I just can’t bring myself to believe that anything but a slick, smooth bullet surface will do the job. Denis, I'm leaning toward "waste of time" for crimping your .30-06 rounds unless you're loading for a semi-auto or pump. I just can’t bring myself to believe that anything but a slick, smooth bullet surface will do the job. Just an aside here... I was in a hurry to make some bullets for an Service Rifle match for my AR. I was loading 75gr. A-max for 600 yards and had to modify my seater stem to accomodate the longer bullet.... any way I did a poor job and the stem left a visible ring around the bullets. I did not have time to get a smoother finish on the seater so I just loaded them up along with the 200-300 yard loads of 75 BTHP, they had a crease ring too. To make a long story short - I shot my best score ever using these bullets! I also for grins had a couple of the A-max loads that had lost the red tips and had a huge open hollow point. I fired them during a practice session at 300 yards in a group with 'normal' bullets ... result no shift in point of impact or opening of grouip size... still holds 2 1/2" at 300 yards with my old eyes on the iron sights. I agree that if you can avoid blemishing or deforming a bullet you should, but if you do....The results will likely not be as wild as you would think they would be. Well, having lurked on this list for several weeks before I joined, I kind of got the impression that the responses might be all over the map. One of the things that caused me to consider using that additional die was the fact that it was fully adjustable in how firm a crimp it applied. One thing that caught my eye in the instructions was that this would work on bullets with no cannelure. Well, for now I'm using the published cartridge overall lengths for the loads in question rather than trying to have the bullet just touching the lands. And I do watch the case length. Being a person who has worked as a scientist and works now as a computer system administrator, I have learned that when troubleshooting or tweaking, you need to manipulate one variable at a time. This week it is the crimp. That makes sense (about the smooth surface). One of the things that I want to see is if this particular die will do a less violent crimp than the crimp shoulder in the seating die. Years ago, my first real "oops" was loading 30/30 cartridges and having the die screwed in a little deep. It was a great crimp, but the case shoulder looked like an accordion. For that reason, I back the die out enough that the crimp shoulder does not come into play. [One of the things that I want to see is if this particular die will do a less violent crimp than the crimp shoulder in the seating die. Years ago, my first real "oops" was loading 30/30 cartridges and having the die screwed in a little deep. It was a great crimp, but the case shoulder looked like an accordion. For that reason, I back the die out enough that the crimp shoulder does not come into play. This effect will be exacacerbated by not trimming to correct length and not adjusting the sizer die "properly". If you are neck sizng and not setting the shoulder back to Minimum dimensions with the sizer, and then you set the seater according to the instructions you will crunch the shoulder as you described. I used to try to neck size but now I adjust the sizer until the sized case drops in my Wilson case gauge. to the GO depth. This allows for positive feeding in multiple weapons and I did not see any detrimental effect on group size...Brass life goes down a bit but I am sure they will feed. BTW - If you want to tax your brain and change all of the variables at once and get your answer "sooner" you can do a DOE(Design if Experiment) and crunch the statistics. You can be surprised at the combination effects that you do not see when you isolate variables and change them one at a time. One word of warning, If you have never done DOE testing it can make your head hurt making sure you have the correct range of all vaiables to test included. I do not do this regularly with re-loading but there is some work on the web describing it. I do use DOE at work though. With the Lee Factory Crimp Die, trim length is not critical and you do not need a cannelure. For me it increases velocity and accuracy and I don't need to worry about the bullet moving. I also use the Lee Collet Neck Sizer which does not give a lot of bullet grip so the crimp helps there. As far as marring the bullet surface, does it even compare to the marring that happens to the bullet jacket from the lands? Maybe 100 times less? Maybe a 1000 times less traumatic? I also use the Bersin tool to correct runout and I can say that the crimp helps to hold the bullet which is evident from the increase force necessary to move the bullet into alignment. So IMO uncrimped bullets would be more susceptible to being knocked out of alignment, either through rough handling or even chambering, than the crimped bullets. I have done 3 tests on bullets that I loaded at the same time with the same amount of powder and seated to the same length. In those tests the velocity increased by an average of approx 10 fps and the group size decreased by an average of 1/8". Which proves that a person needs to experiment for themselves. The few time I have played with crimping rifle cases accuracy definitely declined when compared to un-crimped rounds with identical loads. And yes...the rifling does deform the bullet, but in a longitudinal direction rather than around the circumference. It may make absolutely no difference and I may well be guilty of "over thinking" the situation, but I just can't shake that nagging suspicion concerning less than smooth bullets. But then I also load cartridges by the dark of the moon after muttering several arcane spells.